Standard release doesn't include Tusk act1 and speech plate (Wonder Festival bonus). Soon, this will become reality. His eyes looked derpy or stoned looks less like the promotion face. Am pretty disappointed. 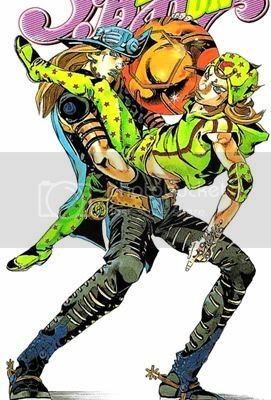 Which is sad becouse I love johnny and part 7. Thanks for the info dude. By observing several users picture, look like Johnny suffer from low QC. Johnny is my fav JoJo but I wont be getting him, he will look like a bootleg next to the old JoJo fig. sulukung (6 maand(en) geleden) #41331857Is his face stay true to the promotional picture? Im on the edge about this one. His eyes look derpy or stoned. He looks less like the promotion face. Am pretty disappointed. Which is sad becouse I love johnny and part 7. Aarongeddon (6 maand(en) geleden) #40840777Like him way more than Gyro. Paint is way cleaner and he's decently poseable, my only compliants are the bullet effects are really bendy ugly, and his alt head is just the standard Medicos shouting face. Is his face stay true to the promotional picture? Im on the edge about this one. Like him way more than Gyro. Paint is way cleaner and he's decently poseable, my only compliants are the bullet effects are really bendy ugly, and his alt head is just the standard Medicos shouting face.